Does Madrid work magic on visitors? Without a doubt. Come winter or summer, this city engages its guests in effortlessly believing that what they see is real. How? Because every single madrileño is a magician and their spells envelop Madrid in a cloak of fascination, attracting the uninitiated with the force of collective magnetism. Madrid is a city that works; Madrid is a city that invites; Madrid is a city that welcomes; Madrid leaves an indelible feelgood mark. To think of magic is to bring to mind charms, rituals, actions, symbols, incantations. Visit or spend time living in Madrid and all these elements will combine to make it a memorable experience. The sense of belonging is bewitching. The welcome extended to a visitor is entitled and genuine. A city of bright blue skies and stunning light, visitors can be forgiven for not managing to visit all of the tourist attractions their first time here, opting instead to spend precious time sitting at local terrace bars mesmerized by the whirl and bustle of locals and guests sweeping about their business. There is an allure to madrileños who are simultaneously provincial and international; who have created a multi-national yet homogenous community in a city that bursts with common purpose. Join them in one of the gentrified markets for pre-lunch appetizers on a Saturday afternoon and feel the buzz. Bearing in mind that lunch isn’t usually served until 14:30h on a weekend (14h on a weekday), but small tapas are served with drinks from 11:30h onwards, it is those appetizers of chorizo and Serrano ham that help distract visitors’ hunger until the main dish arrives. Follow their example and enjoy a dish of cocido madrileño at any of Madrid’s renowned Spanish dining restaurants with one of the excellent locally produced table wines. There are rituals that every visitor and city dweller should follow in order to fully experience the charms of this alluring city. Food-related rituals include eating chocolate con churros at San Ginés and having tapas at a bar in la Cava Baja. Cultural-related rituals include visiting the palace, museums, fountains, plazas and markets that pepper the city and fill the guide books. Consumer-related rituals include visiting the luxury boutiques of the chic “golden mile” of designer shops along Calle Serrano and surrounding streets in the exclusive Salamanca area of the capital. Local rituals include visiting La Pradera and Las Vistillas parks in the month of May coinciding with the festival of San Isidro, going to see a bullfight at the majestic Las Ventas bullring, going to free open air classical concerts during the summer “veranos de la villa” season, or taking a tour of the city lights over the Christmas period to see the buildings lit up in all their glory. Put some comfortable footwear on and walk, walk, walk! There is nothing lovelier, nothing more delightful than to take a stroll through old town Madrid on a bright winter’s afternoon winding up at the curious Egyptian Debod Temple next to the Parque del Oeste to watch the sun set over the Casa de Campo park from the viewpoint which also captures the last rays reflected on the royal palace to the east of the mirador. In the summer this city’s charms offer shade and a breeze in the Retiro Park and nearby botanical gardens, a stone’s throw from the museum quarter that houses the Prado, Reina Sofia and Thyssen –Bornemisza. Madrid offers many visual symbols to cherish and remember. From the idiosyncratic statue of the bear and the madroño tree in the Puerta de Sol to the spectacular “4 torres” skyscrapers on Paseo de Castellana, Madrid covers all tastes. Apart from stopping off to see Santiago Bernabeu football stadium, Real Madrid fans and tourists alike marvel at the monumental Cibeles Fountain , arguably one of the most recognizable of Madrid’s icons, only one block from the Puerta de Alcala gate into the city. Bullfighting fans flock to the Las Ventas Plaza de Toros, the most famous bullfighting ring in the world built in a beautiful Neo-Mudéjar style. Those visitors and city dwellers wishing to be captivated by this picturesque city can do no wrong by taking a ride on the cable car to see a sweep of Madrid’s spectacular symbols, including the Torrespaña “El Pirulí” communications tower, the cathedral and the palace. Ask a madrileño for a saying that sums up the best of their city and about half of them would immediately answer ¡Hala Madrid! (“Come on Madrid!” or “Up with Madrid!”) referring to the commemorative hymn written for Real Madrid football club. Those who follow Madrid’s other team, Atlético, would probably not be so keen to use that phrase and instead would say “del Madrid al Cielo” – which literally means from Madrid to Heaven, claiming that there is no better place on Earth than Madrid. 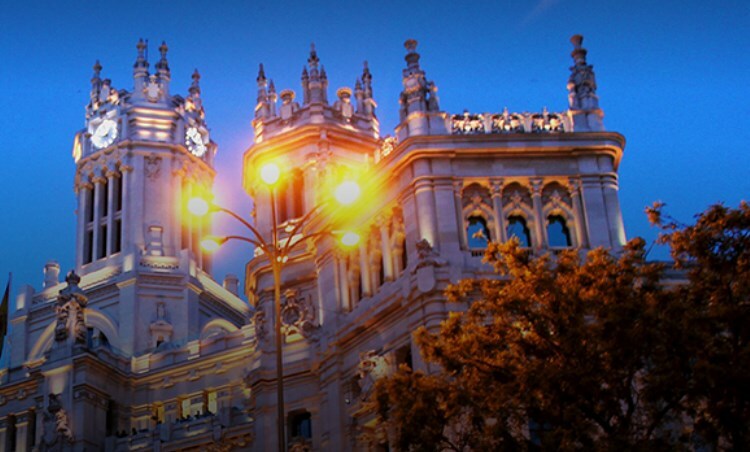 To say that you have been hypnotized by Madrid is to pay a madrileño their biggest compliment. Yet there are no conjuring tricks or illusions; there is no special angle or slant to this city. Isn’t it time you visited and discovered for yourself that Madrid quite simply is magical?